With the Great Bayou Fountain Easter Egg Hunt (a.k.a. cleanup) coming up, we’ve been working overtime to make sure the bayou’s ready. Instead of a single work day, we doubled up on Expedition 19 with a Sunday reprise. The rains earlier in the week had Bayou Fountain hitting the side of the bridge, but after spending the rest of the week gradually falling, it looked like it should be a good weekend for working the bayou. 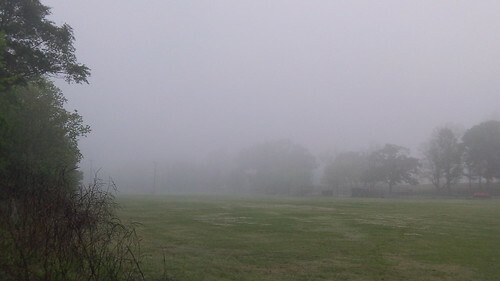 When foggy Saturday morning arrived, the chain gauge was showing just a bit more than two feet of bridge clearance, and the water was a pleasant 67°F. The water level was just about perfect — high enough that launching and recovering wouldn’t be too difficult, but low enough that you only had to duck a bit to coast under the bridge. There was very, very little current in the bayou, and with completely calm winds as well, the surface was like glass. With the foggy skies diffusing the light and making the colors pop, it was yet another fantastic visual feast on the way down the bayou. As we continued down the bayou, the numerous ducks and other waterfowl became more prevalent and some gentle breezes also added their own ripples. 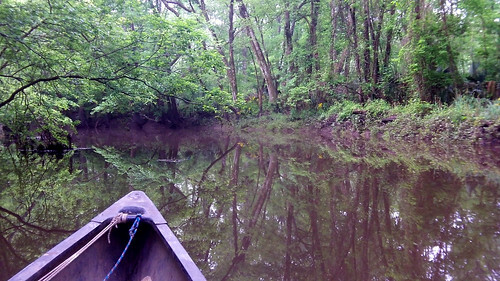 A perfectly mirrored bayou surface is not a sight that remains long, but it was quite nice while it lasted. With the significantly high water earlier in the week, we expected to have a bit of work to do. The bayou did not disappoint. A good bit had shifted around, but the small collections of flotsam were almost all from three causes: very long logs that span the free channel, things resembling the letter ‘Y’, and tangles of branches in the water that catch passing logs and debris. This being the case, we’ve now shifted to a new M.O. Branches get relocated into areas they’ll remain caught, but long logs and letters ‘Y’ get sawed up into non-forking pieces no more than an arm span or so long, unless they’re just too thick. With this new approach (made possible by the ever decreasing volume of problems), the chances of logs catching and causing new blockages is considerably reduced. With the slow progress of the freed logs and such, we decided to give the bayou overnight for everything to flow on down. A small side excursion to scout out the bayou upstream of Burbank seemed reasonable, given the early hour, so that was done. (It’ll get a bit of a write up later.) After getting a bit of rest, we were right back at it Sunday morning. 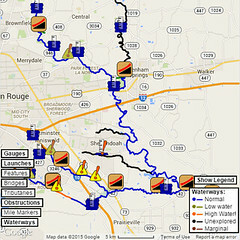 The bayou was a few inches lower (a bit more than 2-1/2 feet of bridge clearance) when we headed back downstream again. The saw-and-send method seemed to have produced good results. We had an uneventful paddle virtually the entire first half. After a couple miles, we started to hit just a few trouble spots, all caused by a single long or forked log or a few tangled branches, and none were in the spots addressed on Saturday. There seems to be a decent reserve of very long logs (thanks to years of practically zero attention to the bayou), but their numbers continue to diminish as we pull them onto the canoes and throw hand saws at them. You may encounter a couple here and there for the time being, but they shouldn’t be a big problem (and will continue to be addressed). Speaking of relatively long and narrow things, after not seeing any snakes all winter, we’re pretty much seeing one or two a week now. This week’s was this nice fellow in a branch by the bank. He was posing so nicely, we simply had to stop for a photo op. (Note to paddlers: If you’re not good at handling your boat, *please* don’t paddle near a snake to take a photo, but you obviously knew that, right?) 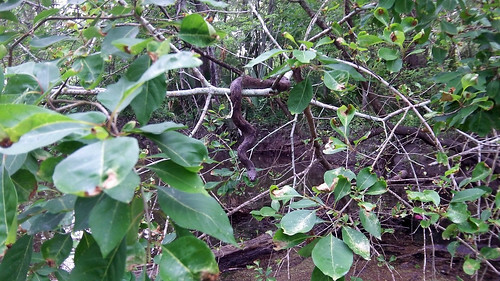 Frankly, we rather enjoy seeing animals of all persuasions out there on the bayou, but for those of who who really, really don’t like snakes, have no fear. 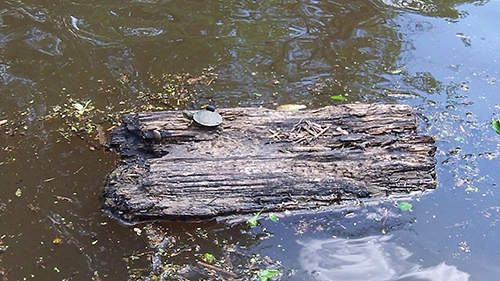 There’s plenty of bayou between the banks to paddle without getting anywhere near the places where every so often we actually get to see one of our little reptilian friends. There was actually a current on Sunday. It wasn’t much, but it was enough to actually see things moving. It made for an interesting paddle back from Bayou Manchac, as there was a trail of duckweed and pollen and little tiny flowers flowing down the bayou. Seeing that made us very happy, naturally, for as long as you’re seeing a “path” along the bayou, you know that there’s nothing blocking the way upstream. (You know you’ve been working the bayou for a while when even the muck looks beautiful, eh?) We had a nearly uneventful paddle back to the park, except for one small incident. After we met a nice pair of people in kayaks they’d just launched from Highland Road Park, I turned around to snap a quick photo… and drifted backward right into the bridge (rather without ducking). We really need to work on our “Heads up!” calls, apparently, but the photo came out, more or less, which is all that matters — after all, I heal quickly. So, our two-part Expedition 19 was a complete success. The high water hadn’t moved *that* much wood into the way — of course, we did have to cut up a bit more of #11 again. At this point, we’re going to upgrade the bayou from “passable” to “clear”. It’s not always going to be perfect, but there should be nothing to cause any notable hardship on the way through. (When the water is very low, of course, hidden things may present, but that’s always the case anywhere, and when we find those spots, we’ll handle them, too.) We’re not stopping here, of course; we’ll keep going out there weekend after weekend for some time yet, but if you can handle the launch and recovery, you have a great place to paddle. Which brings us to our reminder. Next Saturday, April 19, 2014, we’re having “The Great Bayou Fountain Easter Egg Hunt”, i.e. cleanup the bayou day. While we have not yet found any Easter eggs in the bayou, we invite you to join us in snagging all the litter you can bag while we look for them. We’ll have *plenty* of space available to carry full bags out for you, but we very, very much could use help collecting it all. We have had a few people show up along these two dozen days spent on Bayou Fountain since our scouting run back in October, and to those people we offer our sincere gratitude. Now we’re asking everyone who can to step up just for one day to help us. We’ve made the bayou paddle-worthy; now we want to make it presentable. 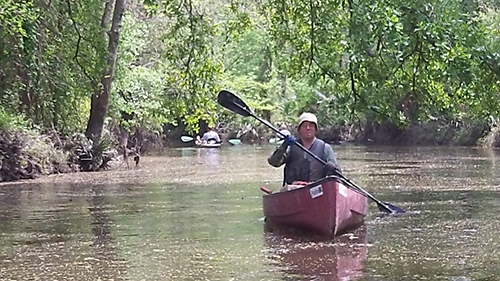 If there is any way you can join in, we’ve got four miles of wonderful bayou that needs just a bit of care from a good group of people. We launch Saturday at 9.